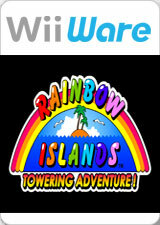 In Rainbow Islands: Towering Adventure! every once in a blue moon, Holly's Comet lands at the top of the monster-infested tower on Rainbow Island. There, she gives humans Rainbow Magic to climb to the top and ask for one wish. A blue moon finally comes around and brothers Bubby and Bobby decide to challenge the tower… Will they make it to the top and make their wishes come true? The graph below charts the compatibility with Rainbow Islands: Towering Adventure! since Dolphin's 2.0 release, listing revisions only where a compatibility change occurred.